When one considers the characteristics of the “movie musical,” things like big, grand orchestrated song and dance numbers and big set pieces often spring to mind. Conversely, crack houses, the L.A. riots, and hip hop music are not usually the first things associated with the genre. Nonetheless, the genre of musical cinema, in its simplest terms, explores characters who engage with music in a way that reveals something about them. And it is within these terms that I suggest the new biopic Straight Outta Compton, about hip-hop group N.W.A., is most certainly a movie musical! Now Straight Outta Compton may not have big song and dance numbers or big set pieces, but the film is most certainly big. Its ambitions are big, its cast is big, its running time is big, and currently sitting at number one for its third week in a row – its box office is big. The film opens with a tense drug deal gone wrong where Eric “Eazy-E” Wright (Jason Mitchell) narrowly escapes an unsatisfied customer and the LAPD. Director F. Gary Gray then takes us on a quick tour of the city of Compton via introductions of the other four soon-to-be members of N.W.A. including Ice Cube (O’Shea Jackson Jr.) and Andre “Dr. Dre” Young (Corey Hawkins). Compton has its nails dug into each of these boys one way or another, but if there’s one thing the streets have taught them, it’s that their stories are worth telling. What follows is a fairly conventional rise to and fall from fame story, complete with corrupt managers like Jerry Heller (Paul Giamatti), struggles with the excess that come from success, and acts of retribution by those who have been wronged. The element that makes this film rise above the conventional is, of course, the music. Like any good musical, the songs play a role as big as any character. The evolution of the group’s most famous anthems are well documented and the group’s cause against the corrupt and downright racist establishment that they have been victimized by is “expressed” with great care. I found myself engrossed in the way this film presented the record business. Many films have depicted the rise of the music artist and the corporate paradox between the money and the art, but Straight Outta Compton shows how unique that process is for Rap and Hip-Hop, especially for a group that was such a trailblazer. It is in this facet that Straight Outta Compton is most impressive. Also, keep an eye out for “cameos” from some of the other key players on the scene as street rap started taking off. On the other hand, the genre of street rap is admittedly not very “woman friendly” and the same can be said about this film. Female characters are few, far between, shallow, and flat (in the character development sense). Recently, Dr. Dre made a public apology to the women he has hurt, and while much of his misogyny is rather glossed over in the film, the tone is undeniably present with what little dealings with women the film displays. This is not a new criticism when it comes to the latest blockbusters (see my San Andreas review or any Transformers film for more evidence), but a desensitization is emerging. Maybe it’s not a film like Straight Outta Compton’s job to start swinging the pendulum the other way, but that doesn’t excuse the gauche factual omissions that consequently rebrand these men as complete saints. 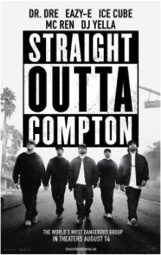 Straight Outta Compton is rated R and has a running time of 2 hours and 27 minutes.